Coming at you with another foundation review! This time, it's from the Korean beauty brand Innisfree. 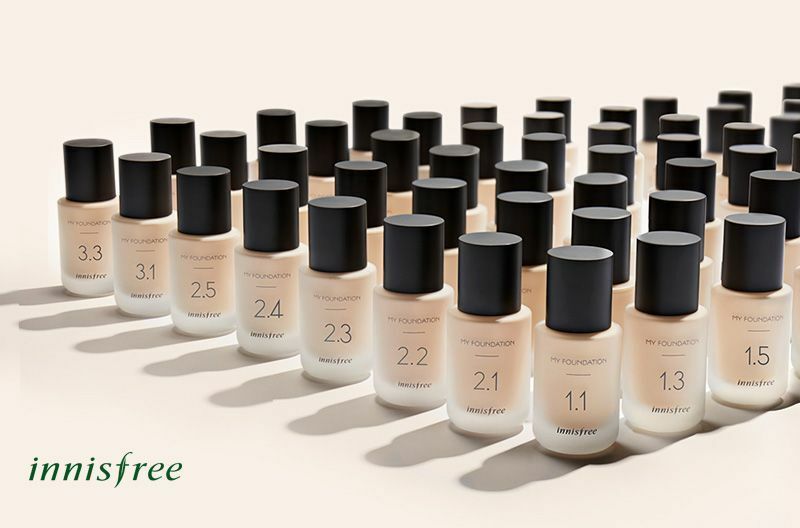 I love the Innisfree No Sebum line for my oily skin because it works wonders on my skin so I'm super excited for this foundation because it contains Jeju Volcanic Ash and it is customisable to suit your skin needs. This foundation retails for ~$18 and you get 1 fl oz/30 ml of product in a glass bottle with a pump. There are 50 combinations to choose from (some sites say 50 "shades" but it's technically "combinations" because there are only 5 color shades). As you can see, the bottles have got a decimal number on them and it basically represents the moisture and coverage level. From what I have researched so far, option 2 (semi-matte) is pretty dewy so if you have oily skin, you might want to stick to the matte finish. The second digit represents coverage - 1 being the sheerest up to 5 being the fullest coverage. If you want something in between, go for 3 or 4. Finally, choose your shade. This is printed on the top of the box or bottom of your bottle. There are 5 shades to choose from: C13, C21, N21, N22, N23. 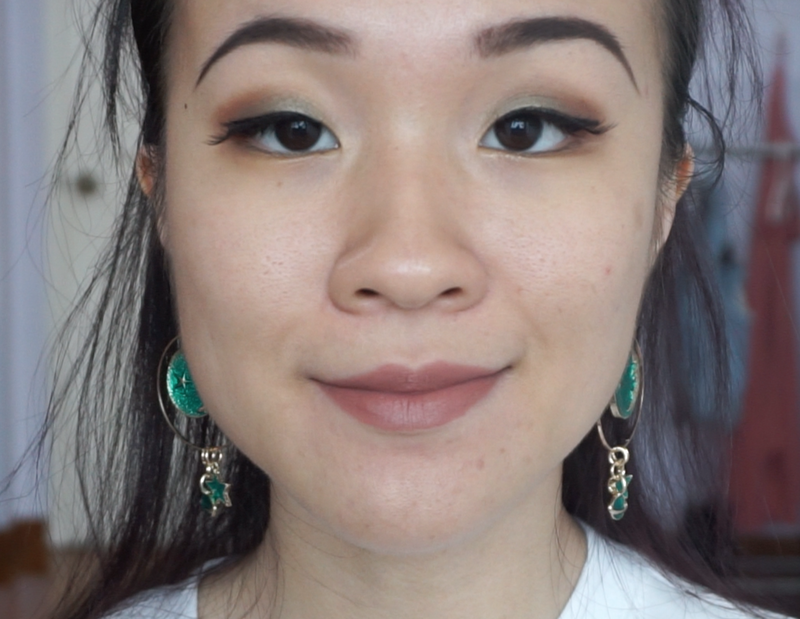 If you know your Korean foundation shade, this should be pretty easy. I am NC 20 and I usually wear #21 in Korean foundations. I chose N21 and it applies pretty pale at first but the foundation does adjust and darken a little bit so it looks much better after awhile. Take note that this foundation does not contain SPF. So, this is my bare face. You can see my enlarged pores on my cheeks and some blemishes all around. I have oily combo skin. I primed my face with the Kiss NY Pro Mattifying primer, which I have been using as a control primer in all my foundation reviews. I got the foundation in 1.5 (matte, full coverage) and shade N21. You can see it blends out a little bit lighter than my skin tone and looks kinda ashy at first. It does warm up to my skin tone after awhile. The texture of the foundation is quite creamy and there is some "grip" when blending out with a brush so it doesn't feel super smooth to spread. Regardless, I had no issue with blending it out. Final result with one layer of the foundation. I used about 80% of one pump for my face (excluding forehead because my fringe covers it). As you can see, the coverage is pretty good and definitely a high cover. My blemishes are almost covered, especially my sun spot! Pore coverage is pretty average. They are minimised but not totally covered unlike some foundations. This foundation definitely has a matte finish and it might be slightly tacky at first but it settles to a smoother matte. 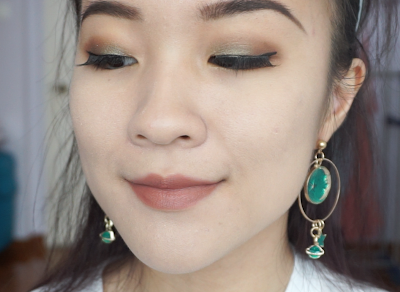 For the first wear test, I decided to set half my face with powder from Kokie Cosmetics. I ended up wearing it for a total of 8 hours. The foundation did start to break down and separate on my nose after 2 hours, with the powdered side holding up better. My cheeks weren't shiny yet but by the 3 hour mark, they did start to have a bit of oil. The foundation doesn't really transfer when blotting so that's good. At the end of 8 hours, the foundation wore off on my nose, cheeks and chin. The drier sides of my face were starting to show signs of separation and the foundation just felt sticky and uncomfortable at this point. The second and third time I tested this, I wore my Innisfree No Sebum Blur Primer and Innisfree NO Sebum Mineral Powder. In my opinion, the powder really works with this foundation to control oil better and make the foundation last longer. I found that my face didn't really get oily until about 5-6 hours in. Also, the foundation only wears off on my nose rather than my entire face. At the end of 8 hours, it still looks good everywhere with the exception of my nose. 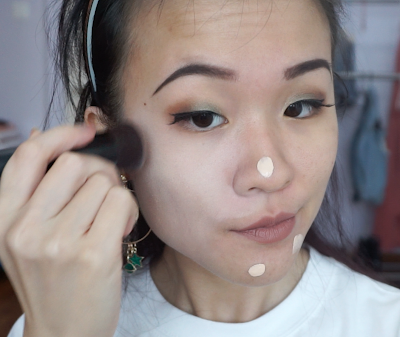 Overall, I like this foundation for its high coverage but because I rank my foundations based on how it performs alone (without powder/primer), I cannot say that it did very well. Oil control and lasting power are lacking when it is worn alone and definitely cannot compare to Western brand foundations. Unfortunately, this is going to be ranked at number 12 for me. However, if you can get it to work for you with the right powder/face combo, it might got up to number 6.